Leslie Edwards Humez, Cleveland's #1 sculptor in a jugular vein, has been juried into Salmagundi Club NY's non-member exhibit for the second consecutive time with "GLUTTONY: Make Me One With Everything." 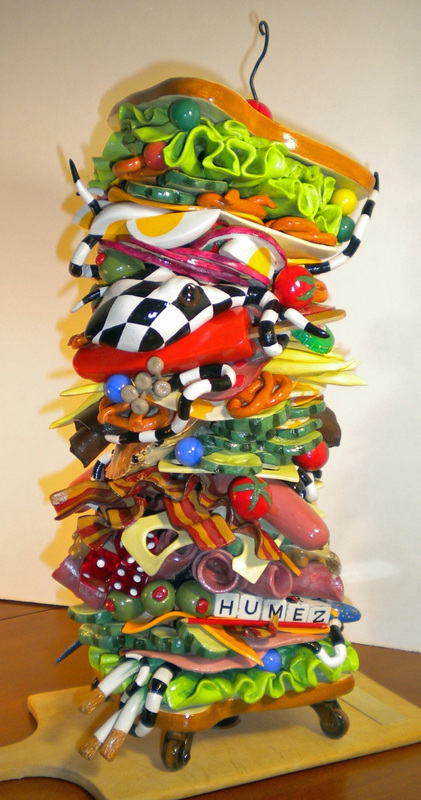 This mega-sandwich, slathered with twenty-two inches of imagination including Humez' signature octopus and some very cool found items, has been sculpted from a proprietary mix of cellulose and porcelain clay and is painted with acrylics. It's loaded with indulgence and surprises; once again, Humez has delivered the metaphoric goods promised in it's thesis and title. Salmagundi bar open to artists and guests for the show's duration,.